The creation of the new residential district in north Chichester has raised the issue of the need for new community facilities to serve this large new community. The choice of the former hospital chapel building as the site for these facilities is a wonderful opportunity to create a asset for community use – one that restores and cherishes a listed building and that tells the story of people who have often been placed outside the community. The overriding intention is to convert Graylingwell Chapel to its new uses in a way that conserves and enhances its character as a listed building. 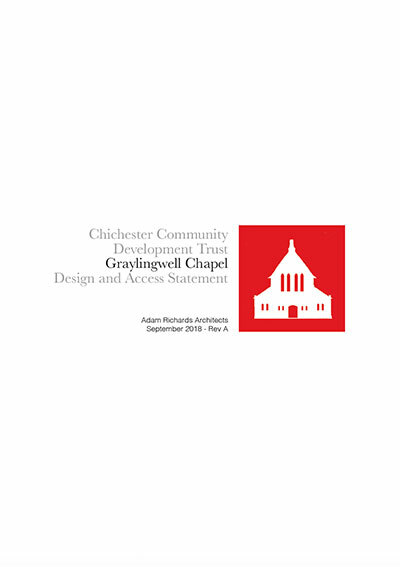 The spaces chosen for the new uses have been selected for functional reasons, but also in a way that complements the aims to transform Graylingwell Chapel into a new heart for this large new community. The project aims to conserve the historic fabric of the chapel whilst sensitively converting it for mixed community uses. These uses should become an asset to the area, and more widely, helping to create an inclusive place to which people of all ages and backgrounds are drawn. The intention is to incorporate exhibitions and interpretation about the history of the site and its association with mental health. The building’s programme will be all inclusive and cater for all ages of the community. By making a community visible to itself it becomes possible to help build that community and build resilience within it. This is the core aim of the Graylingwell Chapel project: making a space for a creative, cohesive community. Graylingwell Chapel is the only remaining public building left on the hospital site and its historic close links to the well-being of patients alongside its architectural significance makes it an ideal location to convey the story of Graylingwell Hospital. 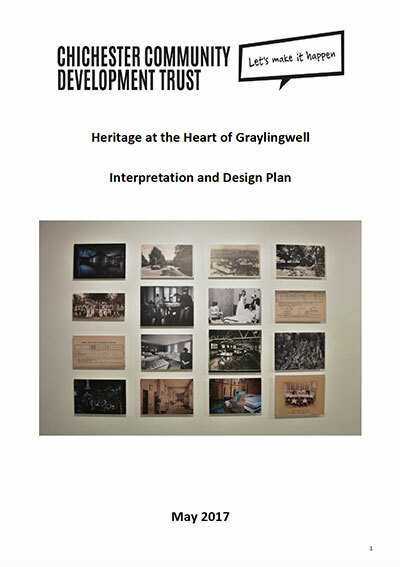 CCDT in partnership with Pallant House Gallery, University of Chichester and WSRO drew together the skills and expertise not only to preserve the material history of the site but also to bring to the fore the personal stories and memories of those associated with Graylingwell. The community-based arts and heritage programme recorded oral and written histories, uncovered artefacts from the Hospital, preserved the patient records and created artistic responses. The artefacts discovered included artwork produced by the patients to facilitate ground-breaking treatments and the magic lantern used for shows in the Hospital theatre. 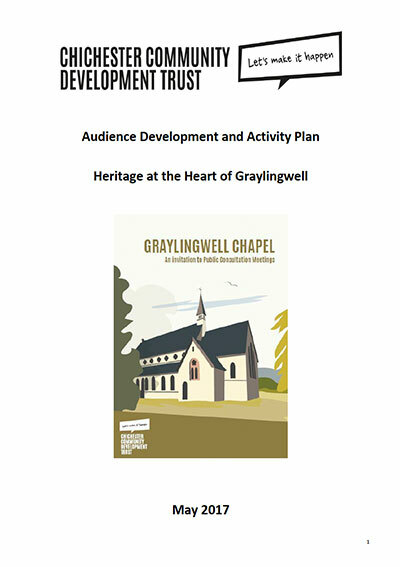 The Graylingwell Heritage Project demonstrated the importance of the Hospital to the local community and of the preservation and display of the heritage on the site. 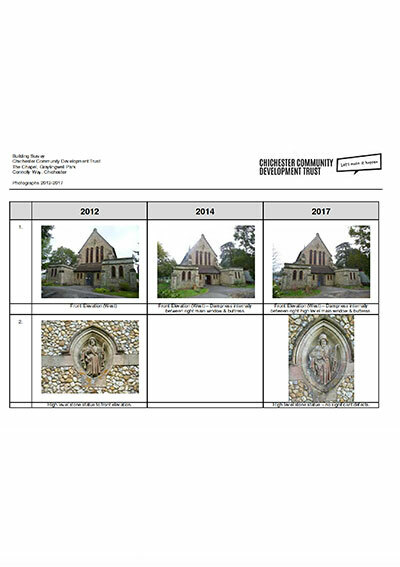 During 2016/17 CCDT received grant to consultation sessions with stakeholders, local residents and community groups to develop plans for sustainable community use of the chapel. To form a Steering Group to represent local interests, undertake visits to projects to inform development plans for mixed community use and heritage interpretation and organise training for staff, trustees and volunteers. Additional funding was also secured from the Architectural Heritage Fund to support the appointment of an architectural practice to produce concept designs. The trustees, staff team and volunteers worked for 6 months to submit the application to the Heritage Lottery Fund for a Stage one application for a Heritage Grant in April 2017… and then kept everything crossed. In September we received the amazing news that we had been successful with our stage one application and we celebrated in style with local residents at the Chapel complete with candle light. Thanks to the team at the HCA and Linden Homes we became the proud owners of Graylingwell Chapel, Chapel Green to the south and the play area to the North. Adam and Giles from ARA and Richard from Whaleback worked throughout the summer to ensure our deadline for submitting the planning permission to CDC was achieved and once again the team keeps everything crossed for a successful outcome. The end of the year brings the deadline for the Stage two application and the team and volunteers have worked round the clock to get everything ready! The announcement of the stage two application will be made…. Contractors will be appointed and work on the redevelopment of the Chapel will begin! …and with a little bit of luck and a lot of hard work we will open the doors of Graylingwell Chapel to all.